Providing you the best range of drop forged putlog coupler, pressed putlog coupler 5 mm and putlog coupler with effective & timely delivery. Our technological adeptness has made us the pioneers of manufacturing leading quality Drop Forged Putlog Coupler. Widely appreciated for its permissible load, our offered putlog couplers are one of the major components of scaffolding, which are used to connect tubes to ledger at a right angle. These couplers are developed from forged steel and can be availed from us with varied dimension flange nuts. We have gained wide acceptance for being the reliable entity involved in manufacturing best in class Pressed Putlog Coupler 5 mm. 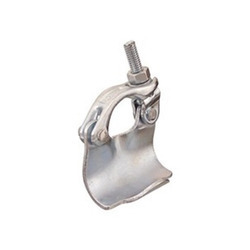 This is a single coupler developed from pressed steel to provide heavy duty scaffold support by connecting putlog or transom tubes to ledgers. The offered couplers are suitable for 48.3 OD Tube size and can be ordered in zinc plated finish from us. We have established ourselves as reliable manufacturers for best in class Putlog Coupler. These couplers are widely demanded to support the scaffold boards by connecting transom tubes to a ledger. Further, our offered putlog couplers features a one piece wrap over design that assures movement resistant. Developed from superior grade material the offered couplers can be ordered with mild steel or boron steel tee bolts. By manufacturing highly efficient Putlog Coupler, we have gained a wide appreciation of being the trusted entity for pressed steel scaffolding accessory. The offered couplers are best suited to connect putlogs and transoms to ledgers. Available in mild steel or boron steel tee bolts, these putlogs couplers are finished with durable zinc plating.